Air fresheners are great, however they are not always convenient. I really like the Air Wick plug ins, but the small room with our toilet in it, or the toilet closet as we call it, does not have a plug. I have tried many other non plug in air fresheners, but they do not last very long. I found a great idea the other day on how to keep the bathroom smelling clean and fresh. Simply apply a few drops of your favorite essential oil on the inside of the toilet paper roll. 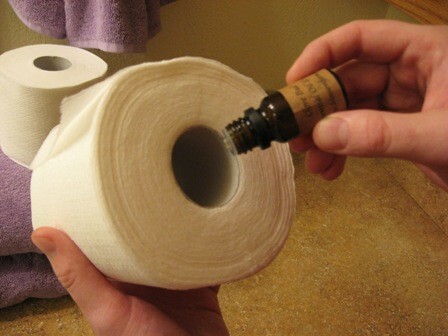 Every time you use the toilet paper the smell is released and will keep your bathroom smelling fresh. If you are unsure what type of oil to use I am a big fan of lavender. Smells wonderful! Our vegetable garden is starting to blossom and the bugs are discovering our goods. I read an interesting article about using onion and garlic scraps to make an organic pest control. We try to use all organic substances in our garden and I will be giving this a try soon. I will post an update in the next few weeks. Basically to make the organic pest control collect all of your onion scraps and keep in your fridge until you have a Tupperware container full. Simply add water once full and let the onion soak for a few day or up to a week. Place in the sun to help the onions steep. Then strain the liquid into a spray bottle and spray on your plants. Bugs do not like the smell of onion or garlic and will deter them from munching on those tasty veggies. The onion scraps can then be buried by plants to help keep the bugs away. I am excited to try this method and will give an update soon. The summer is approaching and this means weeds, lots and lots of them. Since my boy love to play outside we try to avoid toxic chemicals around their toys. White vinegar is a great non-toxic solution. Put some white vinegar into a spay bottle and spray away at those weeds. For best results you should do this on a dry and sunny day. The acetic acid in the vinegar does a couple of things. 1. It burns the weed’s foliage on contact. 2. It temporarily lowers the pH of the soil, making it hard for the weed to make a comeback. The vinegar is fast acting, inexpensive, and won’t do any permanent damage to the soil. 1. Put a small box in your refrigerator or freezer to eliminate odors. 2. To avoid clogged drains pour 1/4 cup down the drain and wash down with warm water. 3. To clean children’s toys mix 1/4 cup baking soda with 1 quart warm water. Wipe toys or rinse in mixture, then wash with clean water. 4. To remove stains from most surfaces combine 3 parts baking soda to 1 part water. Apply to stain, let it sit a while, then wipe away with water. 5. For tile floors mix 1/2 cup baking soda in a bucket of warm water. Mop then rinse with water. 6. Sprinkle some baking soda on carpet then vacuum up. 7. For counter tops sprinkle baking soda on a damp sponge or cloth. Scrub then wipe clean with water. 8. Add a cup of baking soda to your laundry load to help brighten clothes. 9. To remove oil and grease stains from the driveway pour baking soda on area and scrub with a wet brush. 10. Sprinkle some baking soda in the bottom of sneakers, gym bag, or backpack to eliminate odors. I hope you find some of these simple tip helpful with eliminating some of those common household odors! My wonderful husband recently spilled candle wax all over our kitchen counter top and tile floor. It was not a fun mess to clean up, but here are some tips on how to remove that awful wax mess. – Take a blow drier and heat up the wax, then wipe away with a rag. Use a mixture of 1/2 vinegar and 1/2 water to remove the remaining residue. – First you will want to remove the wax by scraping it off, as much as you can at least. – Place a flat paper bag or cloth over the stain. – Iron the stain through the paper bag, and the stain should then iron on to it. Spray with a stain remover and place in the washing machine. My number one tip would be to not spill wax!! It is very messy and time consuming to clean up, but at least there are ways to do it. Simple Cleaning Schedule, Keep It Up! Don’t let the laundry pile up, try to fold a load every night. You can do this while watching TV! Do something for your self every night after the kids have gone to bed (take a bath/read a book). Take 15 minutes every night before you go to bed and straighten the house. This may include putting shoes away, going through the mail, putting laundry away, picking up kids toys, and loading the dishwasher. This will keep your house straightened and will prevent things from piling up. This schedule can easily be changed to fit your cleaning needs. Write your schedule down on a white board/chalk board and post it somewhere you can see it. Stay on schedule and save time! Also if you have kids they can help. Have them pick up their toys, fold laundry, put laundry away, load and unload the dishwasher. Don’t feel like you have to do all of the work, have your kids help! This will help them learn to be responsible at an early age. Make that schedule and stick to it! Copper pots: Rub some ketchup on tarnish stains and the acid in the ketchup will help dissolve the stain. Add a pinch of salt to the ketchup to remove tougher stains. Skunk Odor: If you do not have tomato sauce on had you can try ketchup. Rub ketchup over effected area they rinse. Artificial plants sure do make a home feel classy and cozy. When the dust starts to collect on the leaves though, they tend to loose their real look. Cleaning each individual leaf is time consuming and not much fun. Here are a few simple ways to get your plants looking brand new again. Wet Method 1: Take your silk plant or tree and simply rinse the leaves off in the shower with cold water. Put the shower head on gentle and try to avoid getting the basket or pot wet. Warm or hot water will ruin the glue so cold water is recommended. Give the plant a little shake and then just let it air dry. Wet Method 2: Take your plant outside on a cool day and hose it off with the garden hose, then let air dry. 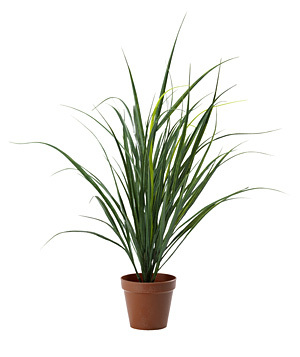 Dry Method 1: Use an air compressor or a compressed air can and spray the plant. We recommend doing this outside to prevent the rest of your home from getting dusty. Most of these methods will work for most plants, however if there is an excessive amount of dust and dirt on your plant these methods may not work. To remove a heavy layer of dust a cloth and some water may be your best best. Wash every leaf and let dry. Vinegar may not smell the greatest, however it has many uses around the house. Vinegar is fairly inexpensive and is a great cleaning product. Distilled white vinegar is recommended for the uses listed below. Try vinegar as an alternative to chemicals to get things looking sparkling clean! Summer is here and so are the lemons. Lemons can be used for so many great things other than lemonade and cooking. 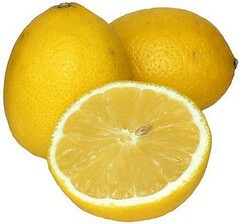 There are several ways lemons can be used in our households for cleaning purposes.